Three weeks ago, my climbing calendar was rudely interrupted. Riding home from work one evening, I got as far as Hyde Park. I was going round the cycle lane at a fair lick (25mph+), when a young lad on a boris bike, meandering around on the pedestrian area, decided to cut onto the lane without looking. I was right on him as he did it, and with a girl coming the other way I had nowhere to go. I managed to avoid striking him directly, but hit his front wheel. Both feet popped out of the pedals, and I skated on for 5 or 10 meters, then hit the ground pretty hard on my arse. Initially, I thought I was in trouble with an excruciating pain in my lower back, but it was just a bit of a jolt from the impact and subsided quite quickly, so I gingerly got up to my feet, thinking "whew, I got away with that one". Then I looked down at my hand. My little finger was pointing out sideways at about 45 degrees - I must have snapped it on his handlebars on the way through. It wasn't sore (yet), but all I could think was "FUUUUUCK. MY SUMMER IS OVER". The young lad tried to apologise, but I didn't really want to listen. The young girl who was with him kept saying "I'm really sorry, he wasn't looking where he was going, are you OK?" over and over again. I was livid, but venting my anger wouldn't have done any good in the grand scheme of things, so eventually I managed a scowling "No not really, I've got a broken finger, but I'll live" in response. Looking back, I wonder how I managed to be so magnanimous. After a rather painful evening at the St Mary's A&E, where they sent an incredibly cute young doctor to do the reduction - surely a deliberate tactic to keep the screams down (and quite a successful one, I sweated and shook, and almost vomited on her, but I didn't make a sound) - I got an appointment to see the plastic surgeon a couple of days later. The initial consultation wasn't too promising. The cute doctor had apparently done a great job of setting it, so surgery wasn't immediately necessary, but due to the location and severity of the injury it was going to have to be totally immobilised and monitored closely. On top of that, they reckoned I wouldn't get the full range of motion back when it did heal. At first, I'd started making plans for one handed training regimes and fingerboarding sessions with the pinkie out of the way (taking a bit of inspiration from this man), but now I had two fingers set in a plastic splint at 90 degrees, for the next two weeks at least so fingerboarding was out, and warnings of surgery if I did anything daft so I had a rethink. I hadn't had a substantial break from climbing/training since last September, and it's good to have a proper four week rest once a year, what better time to do it than when you're not going to be able to go cragging anyway. Three weeks into my recovery, and things are going pretty well. The break didn't move again (despite another bike accident at two weeks, so much for not doing anything daft), and although initially excruciating, I went at the rehab exercises like a man possessed, and already have most of the range of motion back. The rest of me feels pretty good too - the tendinosis that's been upsetting my right elbow for some time has calmed down, and after the usual painful adjustment period to life without a heavy daily load, my back feels light and refreshed. I got the go-ahead to start swimming again this week - which felt pretty weird to begin with, as if the finger was actually being bent around by the force of the water, but now it's getting used to a bit of work again it really seems like I'm getting somewhere with the rehab. I'm a few weeks away from getting back onto real rock yet, but another week and I'll get back to the controlled environment of the climbing gym to start building up my strength again, so when I do get outside I should more or less be able to pick up where I left off. 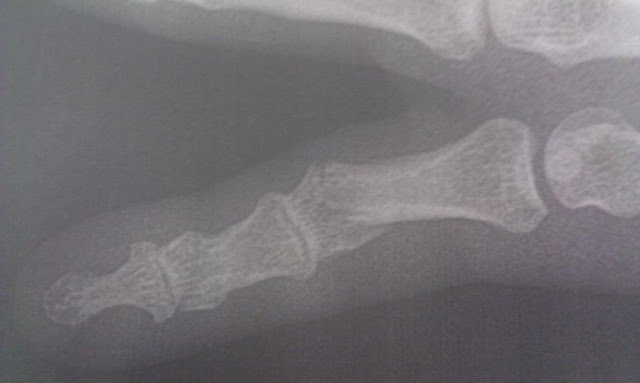 No doubt there's a bit of pain to come as I begin to load the finger again, but i should be back on it in a few weeks so all in all I guess I was pretty lucky to get away with a minor injury that's healing pretty well - even if I didn't quite manage to see it that way at the time. But FFS HURRY UP AND LET ME BACK ON THE ROCK!!! !